FEEL THE POWER OF PROFESSIONAL GAMING! 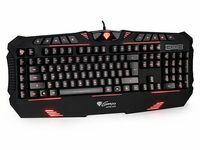 RX66 Gaming Keyboard is a professional gaming device, created for the most demanding, intense gamers. Its more than just a keyboard, in your hands in can change into a powerful weapon against virtual enemies. With RX66, youll go straight to victory and win every battle. Thanks to keyboard backlight, youll have full visibility even in total darkness. This is a great feature that will satisfy especially the night owls backlight make it easy to locate buttons in the darkness . In addition, the backlight control will allow you to fully adapt backlight intensity to different environmental lightning. Ergonomic shape provides comfort and convenience necessary during long gaming sessions. Stable keyboard legs allow you to position the device at the desirable angle. Modern, gaming design, and LED backlight are definitely an eye-catching features. Ergonomic keyboard design provides comfort during long hours of gaming. Profiled wrist rest prevents unhealthy, lifted position of your wrists, which might cause fatigue and wrist pain. Windows key lock is an awesome feature it prevents game from stopping and escaping to desktop, after accidentally pressing the button. That means no more unwanted escapes during most exciting moments of game! 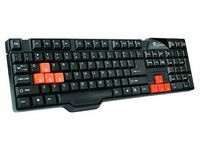 Natec Genesis RX66 has 10 multimedia keys, including 5 programmable keys, placed on the left side, and at the top of the keyboard. With included software, you can program any function you want, and without any problems, turn you computer into the center of home entertainment. With Genesis RX55 using your computer as media center is easy, like never before! Soon you wont be able to live without all these awesome features!